A350 XWB News: A350 XWB still a family of three? There are no news from the smallest member of the A350 XWB since many months. No one says anything about this model, and the A350-800, as Boeing is fond of pointing out, hasn’t had a sale since 2008, “when George W. Bush was president”. Airbus risks order cannibalization as any improvement of its A330-300 wide-body may hurt the case for the A350-800, the smallest member of the A350 family. The A350-800 is in the same size class as the A330-300 -that has won almost 1,000 orders since the early 1990s- but has a lighter airframe, more range, and a lower design fuel burn than either the A330-300 or the A330neo. The further the A350-800 is delayed, the better chance for the A330neo. 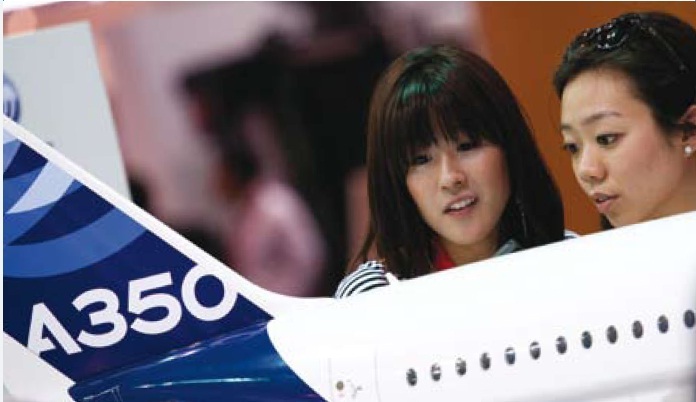 And Airbus is priorizing sales of A350-900 and -1000. The A350-800 has more orders outstanding than the A350-1000, but Airbus has also been encouraging customers to switch from the -800 to the more profitable (for Airbus) -900. Qatar Airways (and his CEO) is the main commercial headache to switch orders as they are not very confident with A350-1000 performance. They are refusing and threatens orders cancellation. Market talk raises lots of doubts whether the -800 has a future. But why not a bigger brother A350-1100 ?